Is the Navy SEAL Ethos still relevant? The below essay discusses some of the processes and challenges that the SEAL community continues to have with getting the most bang for its buck out of its very impressive document – The SEAL Ethos. I think that any organization creating an ethos, vision, mission, or purpose statement, can learn important lessons from what the Navy SEALs continue to do with their Ethos. There is currently a very strong message coming from the leadership of the SEAL community that the values and ideals of the SEAL Ethos must be core to who they are. 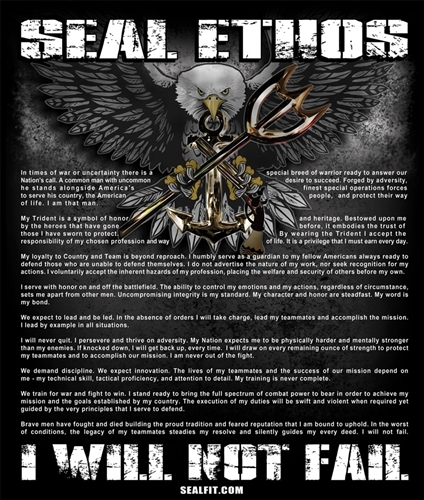 The SEAL Ethos itself can be read here. Ten years ago, a group of about 54 SEAL operators – junior officers, Senior NCO’s, a few senior leaders and even a few retirees, gathered on San Clemente Island and spent several days discussing, arguing, collaborating, and ultimately creating what is today called The SEAL Ethos. They believed strongly that an elite organization needed a challenging goal and a high bar against which its members should always measure themselves. They asked: Are we as good as we can possibly be? How good can we be? What does ‘Great’ look like? Their goal was to hammer out an agreement on what the ‘ideal SEAL’ looks like, and with that, to create a high standard that all SEALs could/should aspire to fulfill. The SEAL Ethos they developed is an enduring image of the ideal SEAL operator, his values, focus, behavior/actions, and character. How good can we be? Answer: Read the SEAL Ethos. That said, few in the NSW community will argue that the SEAL Ethos has been effective at driving behavior and shaping the character of individual SEAL operators. While certain pieces of it are often repeated, such as “I do not advertise the nature of my work nor seek recognition for my actions” or “…wearing the trident is a privilege I must earn every day,” important sections are seldom referred to, and even less often read or discussed. Many SEALs do not take it seriously, rarely refer to it, and are not inspired by it. If that is the case, is The SEAL Ethos still relevant? I would argue yes, but….. YES, it is relevant, in that its description of the ideal SEAL is enduring, and can be applied to SEALs fighting in past, current, and future wars and contingencies. It describes not just a great warrior, but also a great American, whose values, ideals and behavior reflect the best in the American people. And though it’s a high bar, it’s one we should not lose sight of. BUT, it apparently isn’t working to inspire many in the community –whether it’s because of its length, its wording, whether it tries to do too much, or the bar is too high, or simply because some may not understand or agree with everything that is in it. Something else, or another approach is needed to speak to many in the NSW community – those who don’t find The SEAL Ethos meaningful, relevant, or inspiring. One younger, outspoken SEAL told me that the SEAL Ethos just didn’t work for him – it didn’t connect to his warrior-heart. He said that a sign over one of the doors in his command resonated more with him: “It’s the DEED, not the glory.” He, like many SEALs, would prefer something pithy, powerful, inspiring – an ethos that speaks more and directly to his warrior-heart, and less to his head or intellect. Understanding that, one team CO wanted the SEALs in his command to hold each other accountable to a standard, but recognized that the SEAL Ethos was probably not the right document. So he asked his command to prepare their own Ethos – what standard would THEY like to hold each other accountable to? What would best drive better behavior -on and off the battle field? He had an offsite to focus attention on who they wanted to be, which resulted in an impassioned discussion, and ultimately a six point outline of their values, expressed in language which spoke to the people in his command. It is no coincidence that these points are very consistent with The SEAL Ethos, but have a somewhat different emphasis, and are expressed in different language. Most importantly, this team felt that they OWNED it – it was their Ethos – it was not promulgated to them. They had created it, and therefore were committed and felt obligated to abide by and uphold it. Having teams, or squadrons, or even platoons or troops develop their own ethos can be a powerful means of getting consensus and buy-in within the unit on the standards and values they will enforce amongst themselves. In order to create their own ‘Ethos,’ people must ask themselves who they are, what kind of team they want to be, and how they want to relate to each other and their mission. They then must establish their own standards in language which inspires and motivates them. This ‘exercise’ also forces them to consider The SEAL Ethos as a foundational document – to read it, discuss it, argue about what it means, even criticize it – as they put together guidelines for themselves in their own language, within the guiding parameters of The SEAL Ethos. The engagement of the command – the discussion itself – may be as important as whatever comes of it. Ultimately, the goal is to drive and improve behavior – on and off the battlefield. 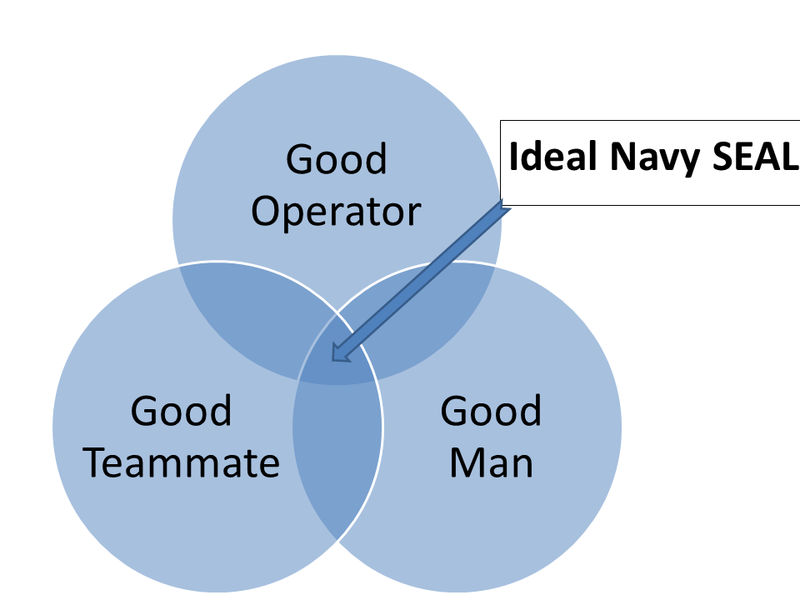 GOOD OPERATOR: Can the team trust a SEAL to do his Naval Special Warfare job well, under any circumstances? Is he at least competent, and preferably excellent, at those fundamental SEAL skills demanded by his team and mission? To be a good operator and a good teammate is a worthy goal and standard for young, as well as more experienced SEALs. However is that enough? Leaders at the NSW Center have been working on an initiative to add a third leg to the two-pronged good operator-good teammate standard of today’s SEALs. The community has realized (again) that SEALs can be good operators and good teammates on the battlefield and in garrison, but still really hurt the Teams and their teammates with actions and behavior outside of those environments. So what might the third leg of that stool be? Is anything else important, after and in addition to war-fighting capability? How about character? Be a Good Man? While the character piece is woven into The SEAL Ethos, it is notoriously difficult to measure, and even more difficult to develop. A number of NSW leaders are considering ways in which SEALs in the Teams can more directly and explicitly judge, and even shape character and integrity in each other, and build character into the criteria by which SEALs measure each other. Such a process would also provide a means by which SEALs can hold each other accountable for being not only better operators and teammates, but better men as well. It will be an interesting – and worthwhile – discussion: What constitutes the standard for “good man” in the Teams? I anticipate an animated discussion and some contention…. So far, The SEAL Ethos holds the high ground in describing the outstanding SEAL operator and teammate who is also an outstanding man. The Teams have gotten better and better at developing outstanding operators and teammates over the years. But how do they make SEALs into better men as well? That is a tall order. Are they up to it? James Kerr, in his book Legacy, about the New Zealand All-Blacks rugby team, notes that when champions are at the top of their game, that’s when they raise the bar. I serve with honor, on and off the battlefield. In the absence of orders I will take charge, lead my teammates and accomplish the mission. We demand discipline. We expect innovation. The execution of my duties will be swift and violent when required, yet guided by the very principles that I serve to defend. ← Being Good or Living Well? Well written.. being the part of a different elite team, I can whole heartedly relate. This applies to all leaders and teams; who are we? What is most important to us? How do we define ourselves? Foundational documents are just that — principles we turn to when we ask fundamental questions about our goals and roles. Nice work, Bob. I’m sure that you are the epitome of a good SEAL as you are, by anyone’s standards, a good man. I always feel just a little bit uncomfortable commenting on military issues but it seems that your “good teammate” definition is, in “civvy street” the definition of a good friend and a responsible member of the community. Thoroughly enjoyed your article, Bob, and already looking forward to the next one! This is a repost to All American Leadership’s website.